Coupled with rapid urbanisation rates, African cities are experiencing unprecedented urban growth that places pressure on existing infrastructure and creates a demand for additional infrastructure. At the same time, cities’ resources are already under severe strain, given increasing income disparity, low affordability levels, and unstable employment. A key question is how to accommodate this demand in a financially sustainable manner? What are the options available for cities to raise capital to finance public infrastructure and avoid over burdening already scarce resources? One of the tools explored in this regard is land-based financing (LBF) which compliments other financing options such as borrowing, equity, transfers, donations etc. The Global Land Tool Network provides a broad definition: ‘Land-based financing (LBF) is a collective name given to a range of tools by which local governments could expand their revenue base and generate funds that will help them realize their service delivery, infrastructure development and maintenance goals [as well as manage growth]’. This is done by triggering an increase in land values via planning regulations, investment in infrastructure, includes arrangements which result in infrastructure being provided by developers, instituting a process by which to share in the land value capture and using proceeds from value extracted from land to finance infrastructure developments (African Centre for Cities). In other words, it is a way to recover costs by public investment in infrastructure from the private sector. It involves the increase of private sector investment in public infrastructure and leverages off land (serviced by government, hence increasing in value), an immovable asset, to source financing from the private sector to fund city infrastructure. At a seminar hosted in July 2015 by the African Centre for Cities, recent research on land-based financing in Sub-Saharan Africa, funded by United Kingdom’s Department of International Development (DfID), was presented. The seminar debated the difficulties faced by city authorities in the region to sharing in their cities’ land values in order to provide an additional stream of funding to invest in urban infrastructure. 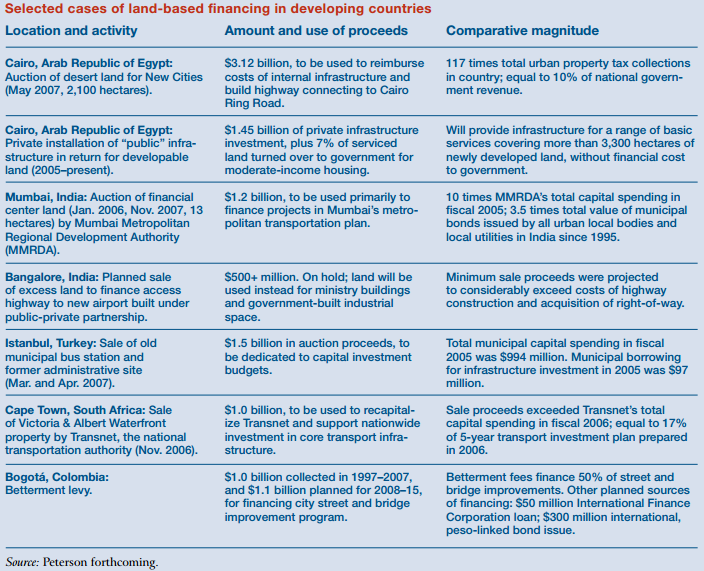 The research identified a range of land-based financing instruments. These were broken down into development-based instruments and tax-based instruments. Development instruments included developer extractions (in-kind contributions by developers), land access related charges (sale, lease of public land assets and sale of development rights) and land re-adjustment. Tax-based instruments included property tax, betterment tax, tax increment financing and development charges not based on cost of infrastructure. Developer extractions, the authors argued, required developers to finance part or all costs of external infrastructure to serve the public need. In-kind contributions were noted as common in South Africa and Kenya. In Nairobi, there have been cases where a developer services land outside of a development where the city is unable to do so. Tax-based instruments allow the public sector to tax any land value gained from infrastructure development. These instruments are available for the different stages of infrastructure development, that is, from undeveloped property to after property development. Of course, land-based financing mechanisms require cities to engage with land markets, and this is relatively new in African cities, especially where title registration systems are only just developing. While some LBF mechanisms require quite sophisticated tracking of land value and markets, others are simpler, imposing a tax or a charge on a development outcome on a cost-basis, towards the assumption of associated value. Cities might start with simpler mechanisms and then, over time, as land values themselves progress and the city’s capacity to measure this improves, move onto more sophisticated mechanisms. All the while, however, the focus on land value as a resource to be applied to development and to enable the city to do more with its resources, is important. Case examples sourced from Gridline are provided below. The ACC project also carried out in-depth case studies of the experiences in three countries–Ethiopia, Kenya and Zimbabwe–as well as vignettes on property development experiences in a selection of other cities in the region. Other country case studies of where the land-based financing tool is used that were documented at the ACC seminar includes: India, Brazil, Columbia (Bogota). Through the ACC research project, Addis Ababa, Ethiopia was offered as an example of existing land-based financing, where land leasing raises 6% of revenue and 9% of capital financing. Nairobi, Kenya, was described as a city with a potential for LBF and Harare, Zimbabwe, was presented as a case where there was a low potential for LBF. Examples of development charges are found in South Africa, Nairobi and Harare among others to leverage revenue for infrastructure financing. The seminar on LBF identified key constraints to LBF which include high interest rates and limited access to funding by the private sector, poor urban governance (and capacity) and policy, weak planning, land availability, weak mechanisms for land value capture, weak land use management systems, poor land regulation, security of tenure and poor access to land. These provide an understanding of why it is so difficult for land value capture mechanisms to be implemented in cities. The ACC projected developed a wide range of materials and case studies which will soon be circulated in the public domain. In addition, to support policy and legislative reform in this field the ACC also developed an African Land and Infrastructure City Survey, which is an interactive, online database to compare the relative states of readiness of each of the region’s 31 biggest cities to implement effective land value capture. All the presentations from the seminar are available on the ACC’s website.